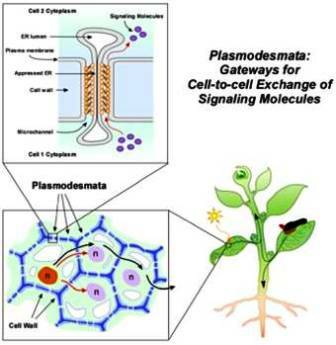 How plant cells communicate with each other? The cell wall is perforated by narrow pores or pits at many places.Through these narrow pores, fine strands of cytoplasm are extending. These strands are called plasmodesma connections or plasmodesmata. These connect the cytoplasm of adjacent cells and facilitate the movement of substance between cells. Plasmodesmata are narrow channels through the wall bound by plasmalemmma containing cytoplasm and often a desmotubule. 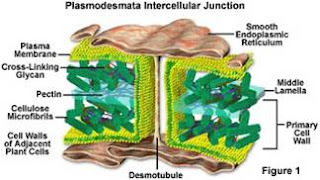 The desmotubule is the cental core and is composed of protein subunits consists of modified membraneous structure continuous with the endoplasmic reticulam of the adjoining cells.These membraneous structures probably originate from the ER. Desmotubule acts as valve to control the direction of flow of materials.The functions of plasmodesmata may vary. It is concerned with the transport of materials from one cell to another and also conduction of stimuli. In the case of certain parasites like Viscum, Loranthus, Cuscuta etc plasmodesmata connections exist between the haustoria and the cells of their host. Through these channels food and virus are transported.